Brightly coloured, bell-shaped flowers on short, upright spikes throughout summer and autumn. Displays get bigger and better each year! Plant this desirable perennial in a sunny or slightly shaded spot and you can enjoy a succession of brightly coloured bell-shaped flowers that are carried on short, upright spikes throughout summer and into autumn. A classic cottage garden perennial that is totally winter hardy and easy to grow. Perfect for beginners and experienced gardeners alike, you’re guaranteed masses of spectacular flowers which can also be cut for your home. 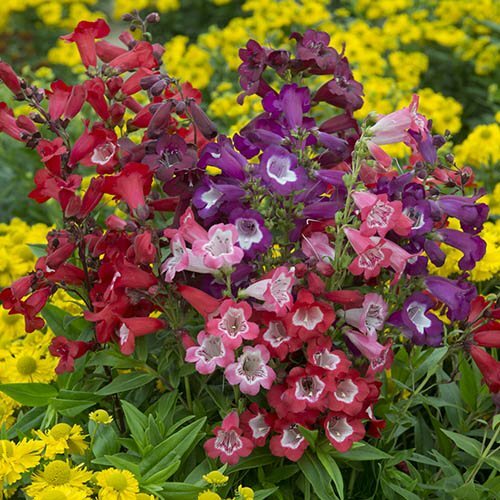 Superb grown in beds and borders alongside other perennials or among ornamental grasses, Penstemon likes well-drained soil and forms large clumps in time, rewarding you with even more flowers. Looking after them is easy; occasionally dead-head fading blooms to prolong the display and cover plants with a dry mulch of compost in late autumn to keep roots snug and protected from frost. Penstemon Heavenly Blue – A low mound of leaves absolutely smothered in electric-blue flowers with a hint of pink. Penstemon King George V – A robust penstemon with stocky growth, covered in red flowers with a white throat. Penstemon Snowstorm – An upright penstemon with bright green leaves and beautiful white bells tipped with pink. Penstemon Raven – One of the darkest penstemons with dramatic trumpets of deepest purple. Supplied as 12 jumbo plugs (2.5 - 3.5cm diameter), 3 each of the varieties listed. Plants are best planted out in the summer, especially if your soil is clay as they dislike winter wet. Penstemons do best in a warm, sunny position and are drought tolerant once established. When planting, add well-rotted manure or compost to the planting hole. Unpack plugs immediately, and stand them in water for an hour. If you can’t do this, they can sit in Mini Greenhouses for a week if upright and not too wet. Plugs may be slightly dry or yellow after being in a dark box in the post but they’ll quickly recover. Put them somewhere warm, light and airy such as a windowsill or greenhouse. Plant approx. 20cm (8in) apart to allow them room to grow. Feed using a high-potash feed such as Blooming Fast Superior Soluble Fertiliser for Flowers & Fruits, to encourage flowering.